QMI is equipped with state of the art machinery to take on any custom tooling needs. Let us quote your toughest jobs! Since 1965, QMI has provided assembly and packaging for various goods and services. Our flexible and well-trained staff adapts easily to each and every job to suit each customers needs. QMI pairs the latest equipment and software with our talented team to provide our customers the highest quality products. At Quality Manufacturing, we know that for a company to achieve true excellence, it must have the strongest and most consistent quality systems embedded into its daily business practices. 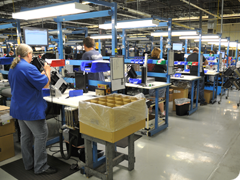 As a contract manufacturer, our expertise in engineering, product development, and production spans numerous sectors. We understand our customers’ needs and we provide top quality products and services to meet those needs. We pride ourselves on our flexibility and ability to adapt to changes in customer and consumer demand.